The 17th Arrondissement is a large district of Paris, holding down the northwest corner of the city. 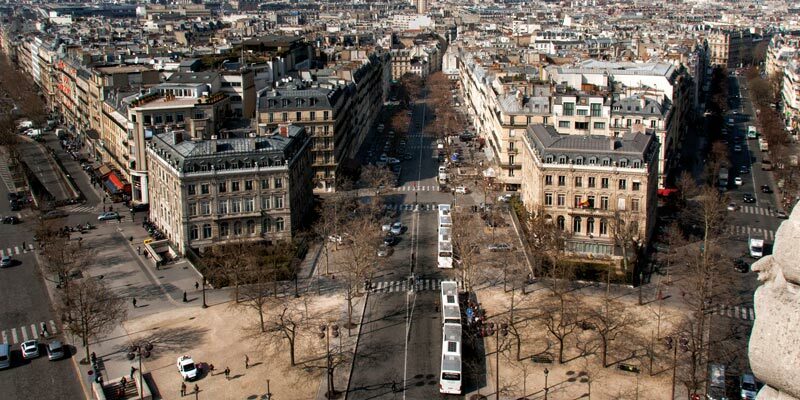 While this district is three times the size of the more famous 1st Arrondissement (the center of Paris, where you find the Louvre, the Tuileries Garden, etc), it is visited by few tourists. Sure, a corner of the Arc de Triomphe touches the southernmost point of the 17th Arrondissement — at the spot where the 8th, 16th, and 17th Arrondissements meet up — but otherwise there is a paucity of iconic monuments. No Eiffel Tower, no Pantheon, no Musée d'Orsay. There is the Palais de Congrés convention center, but that's not really a tourist attraction! The 17th Arrondissement is a residential district, where you find a large number of Parisians living their daily lives. So there are lots of shops, street markets, restaurants, and the kind of services that Parisians need. A lot of people live here, 170,000, but there used to be a lot more when the quartier reached its peak population of 240,000 in 1954. Let's take a look at what Parisians find so attractive about this area, and a handful of things you might want to see. 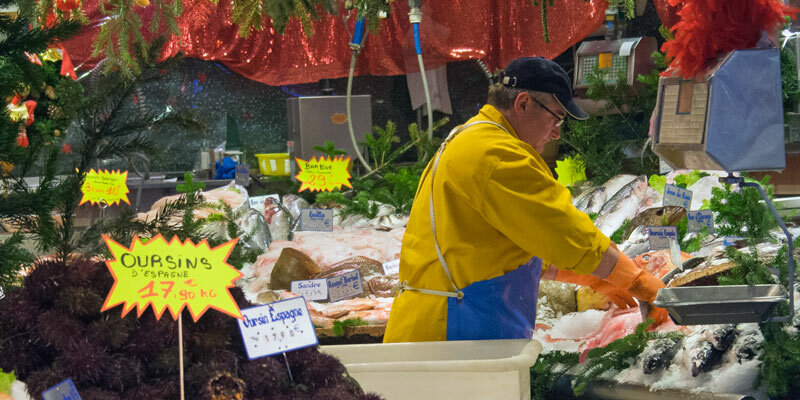 More food stores are located just off Poncelet along Avenue de Ternes, Rue Bayen, and Rue Saussier Leroy. There you'll discover a very good fromagerie, traiteurs (sort of a combination speciality food store and deli), wine sellers, and more boulangeries. 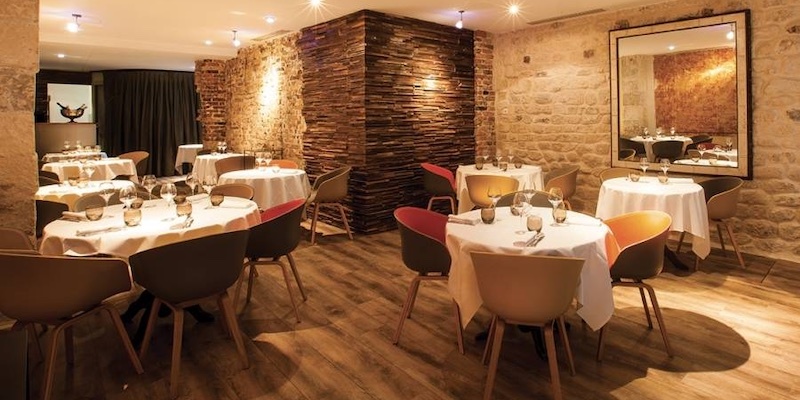 This Michelin one-star restaurant is tucked away on a residential street not too far from Parc Monceau and not too far from Place des Ternes. 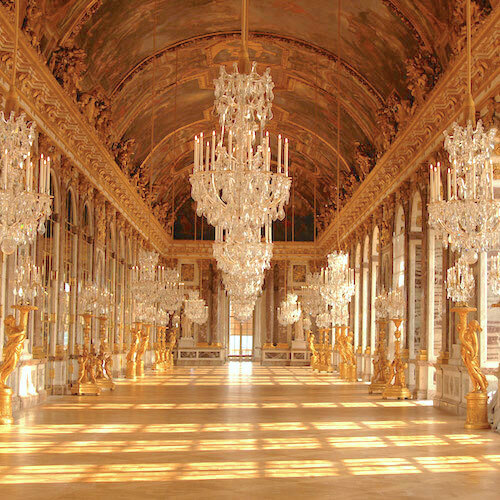 It's not a place you're likely to stumble upon while visiting the sights of Paris, but what a find it is. Chef Faussat hails from southwestern France, near to the Basque country, and the flavours of his youth are evident in his cooking. As we say in our review, his flavour combinations are not to be missed. 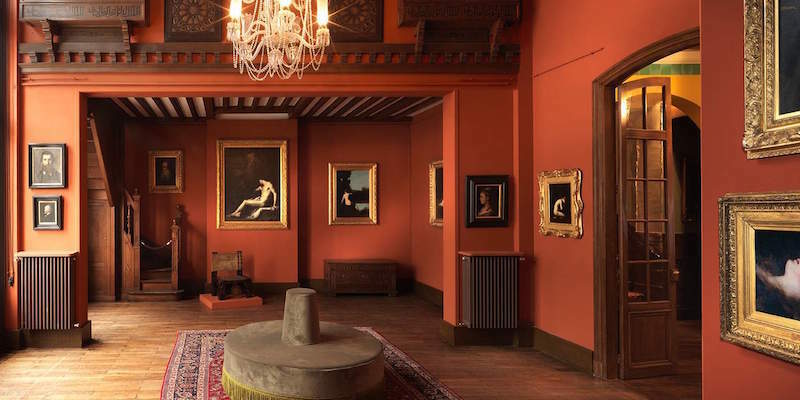 If you've never heard of the artist Jean-Jacques Henner (and that wouldn't be unusual) you might be surprised to find that there's an entire museum dedicated to his work and life. However, it's unexpectedly interesting and even delightful. It's housed in a 19th-century mansion that features, among the artist's work, a charming winter garden. By the way, the reason Jean-Jacques Henner is remembered is because he was an expert in two painterly techniques. "Sfumato" is a way of creating a smooth transition between parts of the painting, to achieve greater realism. 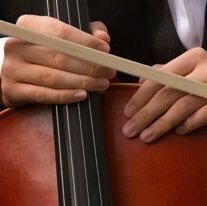 Think Leonardo di Vinci, who may have invented the technique, and Mona Lisa. "Chiaroscuro" is the use of strong contrasts between light and dark sections to create depth and drama. Think Rembrandt and all those Dutch guys. During the second half of the 19th century, Napoleon III ordered his chief city planner, Baron Haussmann, to modernize the jumbled medieval city of Paris. And so, in 1854, a massive rebuilding began. Thousands of old buildings were torn down and wide, straight boulevards were plowed through the ancient neighbourhoods of Paris. Parks were built, sewers were constructed, thousands of new 5-storey buildings were placed side by side along the new thoroughfares. This was also when Paris doubled in size by annexing surrounding towns and villages — including bringing in Batignolles-Monceau to create the then-new 17th Arrondissement. At Place d'Etoile (where the Arc de Triomphe is located) a number of new wide, straight streets were created, radiating out from the center. Among them were the avenues Wagram, Kleber, Monceau, and Mac-Mahon. 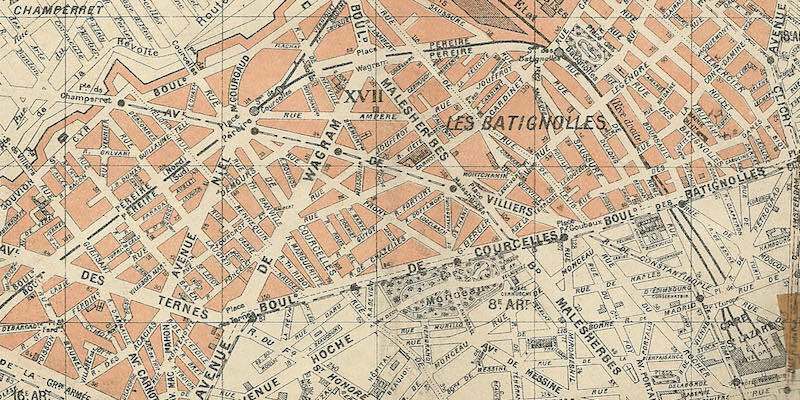 Avenue Carnot was to be the eleventh radial, heading to the northwest from Etoile to cross Avenue de Ternes on its way to the new boundaries of the city. However, when only the first block of Carnot was completed, Haussmann fell from power (followed soon after by Napoleon III himself) and work was abandoned, so that today the wide Avenue Carnot, with its side boulevards and its 5-story buildings, abruptly halts after one block and dumps all of its traffic into the narrow and ancient Rue de Armaillé. 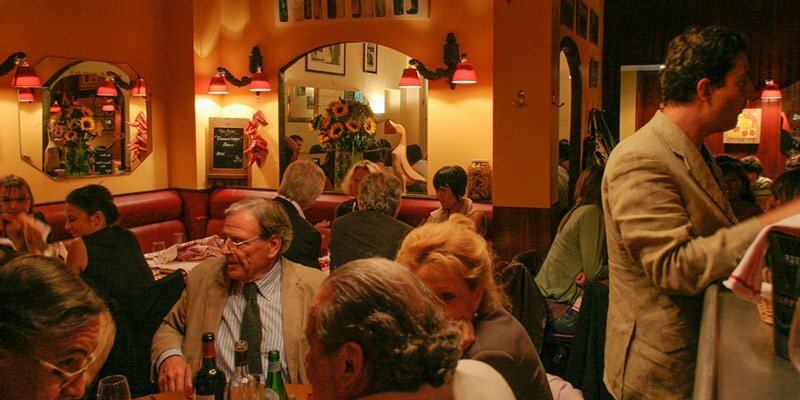 There's a reason why this small bistro is always packed — it serves up good, traditional French fare at reasonable prices. And we do mean "packed". You may have to squeeze past other diners to get to your seat, and servers will be passing dishes over your head. But, that's all part of the charm. Our favorite seat is the corner table at the back left, between the chalkboard and the mirror. The 17th starts at the foot of the Arc de Triomphe and fans out northwesterly to the boundary of Paris. 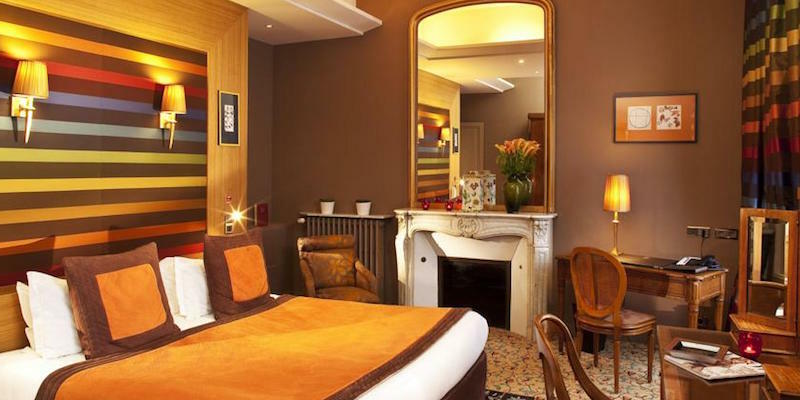 We enjoying staying in the Ternes quartier of the 17th near to the Arc — you're living la vie Parisien among the locals, yet you're very close to the Champs Elysées and other attractions and sights of the city. Here are the hotels we like. The winter garden and library are two wonderful place to relax at this chic hotel. Located in the 17th on a tiny one-way street next to Le Palais des Congrès de Paris, Les Jardins de la Villa is an oasis of calm in this busy part of Paris. This is a Traveler's Choice winner and our top choice in the 17th. A near runner-up is the Splendid Etoile, close to the Metro, the Arc de Triomphe and Champs Elysées. The rooms are spacious and bright, many with balconies and, as a bonus, the hotel is also located on a quiet side street. 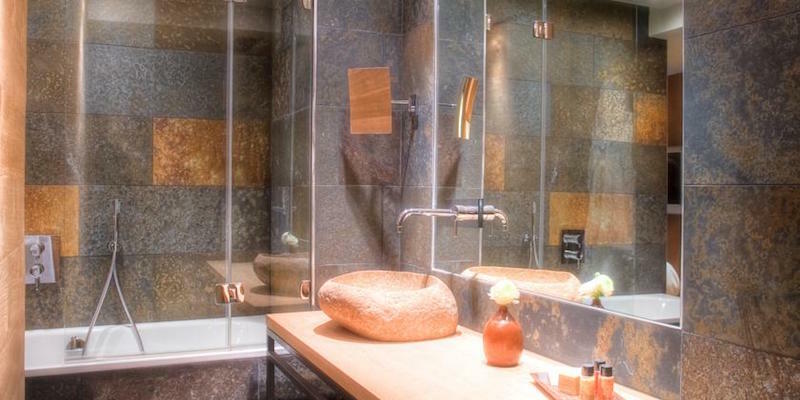 Like one traveler put it, "As the name says… it's splendid"
Located on a small street between Avenue Carnot and Avenue des Ternes, this fresh, environmentally-friendly hotel is an antithesis to those stuffy, Louis-XIV-style hotels. All the rooms have a modern decor with a blend of natural materials. 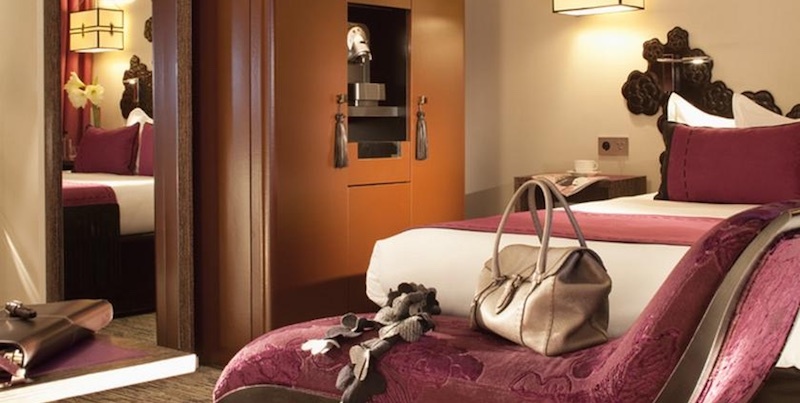 "Superb cozy, feel-at-home hotel," a visitor opines, and we concur. 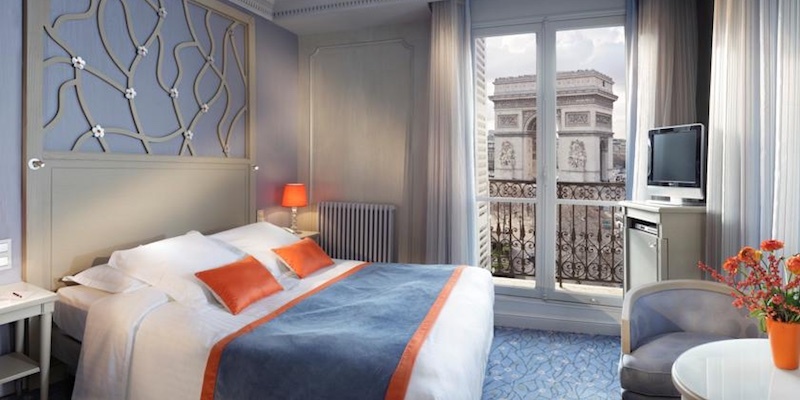 We know we said that Les Jardins de la Villa was our top choice in the 17th Arrondissement, but, really, it's hard to choose between these four hotels — we would stay at any of them at the drop of a hat. We rate them all as "Superb" and the locations are really good. The Regent's Garden is set in a historic mansion and is stylishly decorated with an artful fusion of old and new. Rooms look out onto a large, manicured garden. Just off Ternes, close to Rue Poncelet, in a quiet area. 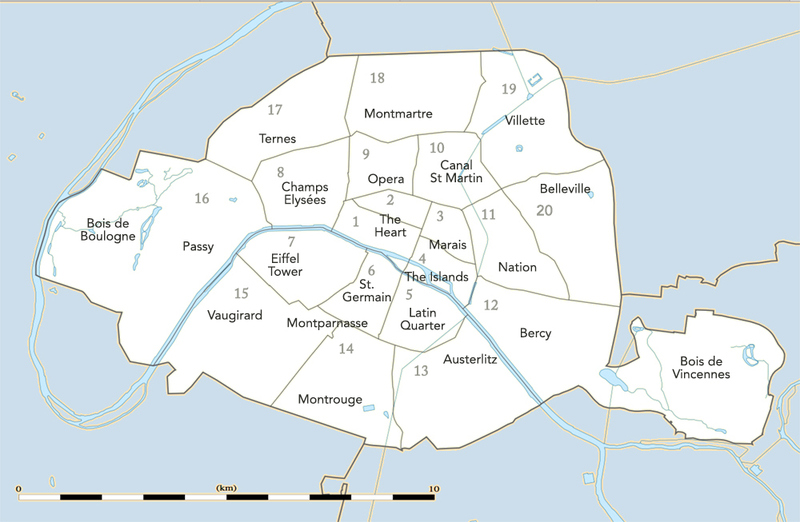 The 17th Arrondissement is three times the size of the 1st, yet it also has three times the population density. That works out to a population of 170,000 versus 10,000. Metro Line 2 comes from the Arc de Triomphe's station (Charles de Gaulle-Etoile) and arcs along the lower boundary of the 17th, eventually ending up at station Nation in the east. Metro Line 3 cuts across the 17th in a northwesterly direction. Metro Line 13 goes through the northern part of the 7th to the city of Clichy, but you're probably not going to go out there.